TEMPE, Ariz. — Arizona State head volleyball coach Sanja Tomasevic has announced the promotion of Carlos Moreno to associate head coach. Moreno enters his second season with the Sun Devil program, notably having served a brief stint as interim head coach in the latter part of the 2017 season. 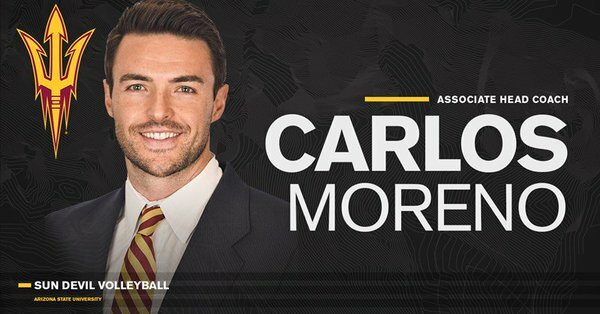 Moreno joined the Sun Devil staff as an assistant coach in February of 2017 after previously serving as a graduate assistant at Southern Mississippi University. During his one-year tenure at Southern Miss, Moreno operated in a number of facets including on-court coaching, recruiting, fundraising, and compliance. Moreno most notably worked extensively with the team’s offensive systems and setters, including All-Conference honoree Sarah Bell. Prior to his stint at Southern Miss, Moreno garnered coaching experience directing camps and clinics in his native country of Brazil, while also serving as the head coach of the University of Sao Paulo Women’s Volleyball Team from 2000 to 2002. Preceding his coaching career, Moreno compiled a prolific playing career as a setter at Brigham University, garnering essentially every national award possible, including AVCA and MPSF Player of the year honors. A three-year starter for the Cougars, Moreno amassed 4,628 career assists, marking the second-most in program in history, while adding 78 career aces (4th-most in program history). Spearheading BYU NCAA Championship runs in 2003 and 2004, Moreno earned a plethora of Player of the Year and MVP honors while also being placed on MSPF’s and AVCA’s respective first-teams. A two-time All-American and the 2004 AVCA National Player of the Year, Moreno led the Cougars to two NCAA tournament appearances, including the 2004 National Championship, and a pair of MPSF Conference titles. Moreno earned a bachelor degree in advertising and marketing at Brigham Young University in 2005, while also earning a master’s degree in Exercise Sciences from Southern Miss in 2017. Moreno’s playing career extended beyond the collegiate ranks, as the Brazil native competed 11 years professionally, concluding his career as a captain of TLM – Volley in France. Moreno was named to two all-star games and was named as one of the best setters at the 2013 CEV Champions League. He won three league championships, one in Brazil, two in France and another one at the European Championships when playing in Slovenia. The son of Antonio and Selma Moreno, Moreno is the oldest sibling of six children. Antonio Moreno participated in four Olympics as a member of the Brazilian National volleyball team. Moreno’s twin sister Anna Allison is the currently in her fourth season as the head coach of Bucknell University volleyball team. Carlos, his wife Maria Eduarda and their son Lucas currently reside in Tempe, Arizona.